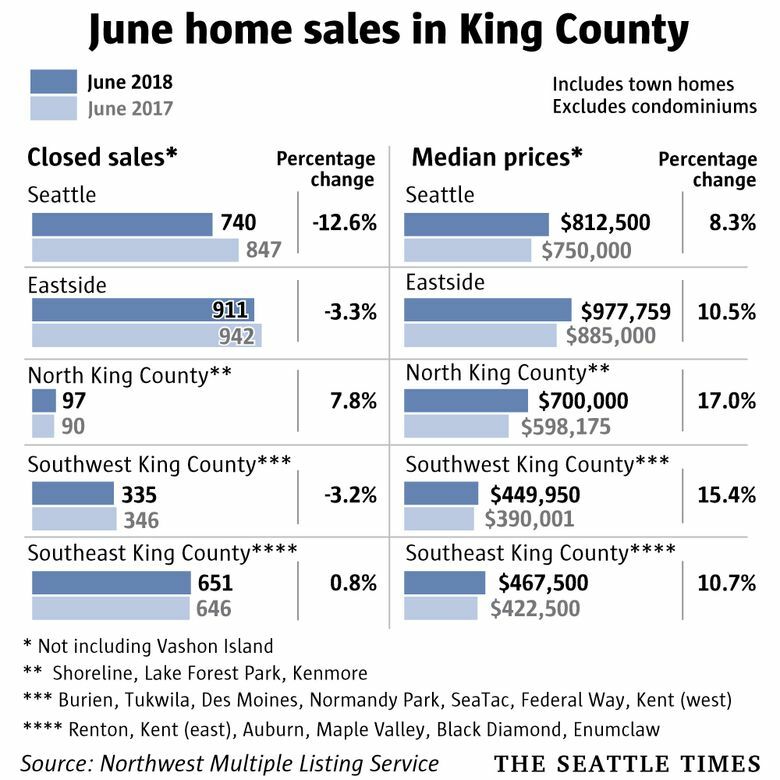 Home prices dropped from May to June in King County for the first time since the recession, as competition among buyers weakened and the number of homes for sale surged. For the first time in a decade, the number of homes for sale in the Seattle area is finally starting to rise — and in a big way — as the rapid-fire market that has led to extreme bidding wars and lightning-fast sales slows a bit. 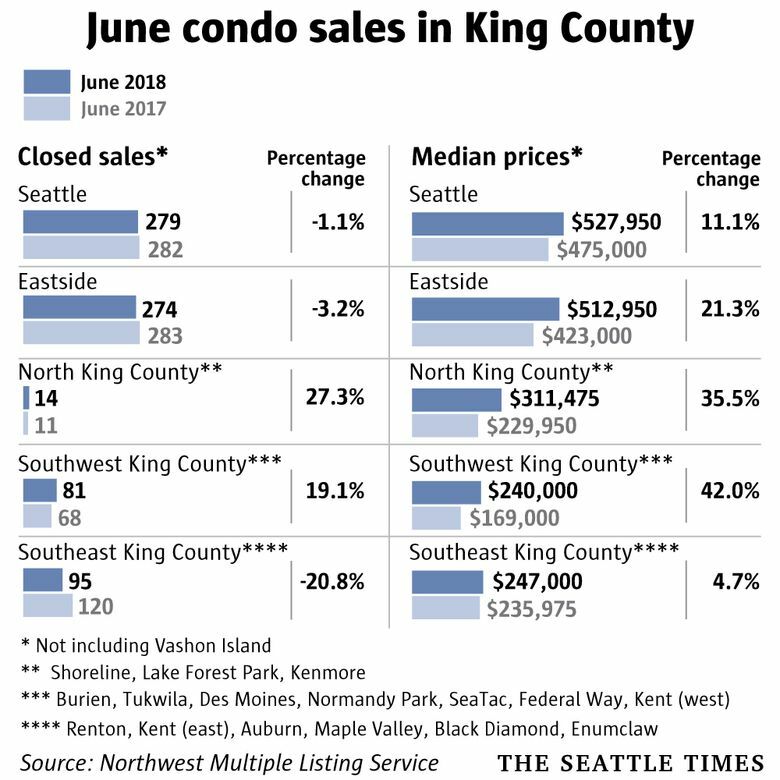 The total number of single-family homes on the market jumped an eye-popping 43 percent in June from a year ago across King County, the biggest increase since the housing bubble and burst a decade ago. Condo inventory rocketed up 73 percent. Interestingly, the reason is that homes already on the market are sitting unsold for longer, as opposed to a flood of brand-new listings, according to monthly data released Thursday by the Northwest Multiple Listing Service. Brokerages surveyed by the listing service said they’d felt a change in the market since midspring, with fewer bidding wars and more homes selling for list price or below. The total inventory of homes listed for sale has now grown for three straight months on a year-over-year basis, suggesting a new trend. But the region has a long way to go to make up for a decade of declining numbers of homes for sale: even with the recent rise, inventory is just over half its long-term average. Home prices across the county still rose 9.2 percent from a year ago in June, but that was the smallest growth in a year and a half. 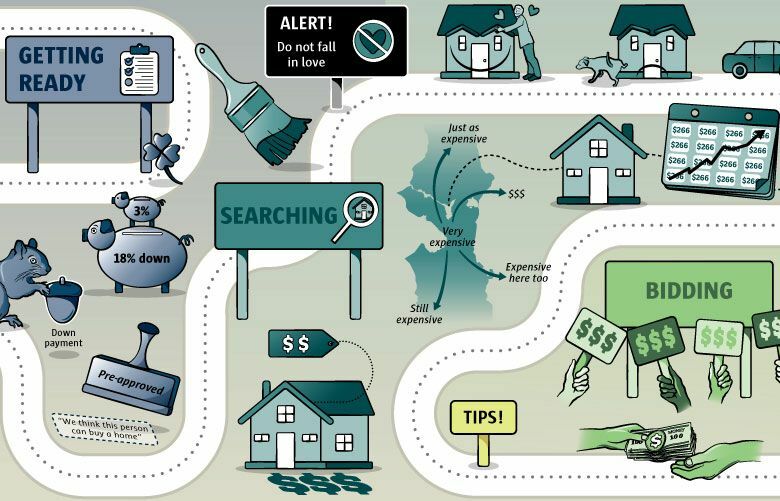 The median King County home price of $715,000 is down from the record-high price points reached earlier in the spring. Brokers also pointed to overpricing from sellers who have grown accustomed to having everything their way. Booth noted a colleague’s clients put their Eastside house on the market recently, hoping to get a huge profit over what they paid a year ago — but they got zero offers, so they pulled the listing. Redfin data showed 32 percent of homes across the region had price drops last month, up from 27 percent a year ago and the highest for any June since the company started tracking in 2012. Culbert said the change means buyers get to slow down and evaluate their options a bit, instead of making the biggest purchase of their life in just a few days. And they may even be able to bypass some uncomfortable conditions that have become standard in today’s market, like waiving inspections and putting down huge, nonrefundable cash deposits. Of course, the market is still no picnic for buyers; it’s just that things have gone from depressing to slightly less depressing. For sellers, it’s gone from giddy to slightly less giddy. Within the Seattle city limits, the median house price reached $812,500 last month, up 8.3 percent from a year ago but down from a record of $830,000 reached a month prior. Prices on the Eastside grew 10.5 percent, to a record high of $978,000. 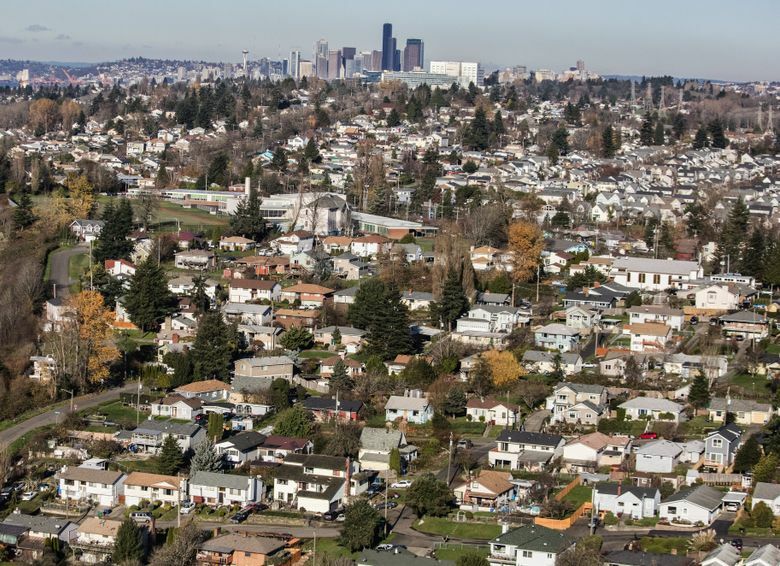 The Seattle area has seen the largest home-price increases in the country for the last 20 months in a row, according to Case-Shiller data, which lags behind a few months and hasn’t caught up to the recent inventory surge. Condo prices countywide still grew 11.7 percent, despite the massive increase in condos for sale. Elsewhere, Snohomish County’s median single-family home hit a record $511,500, up 13.7 percent from a year ago. 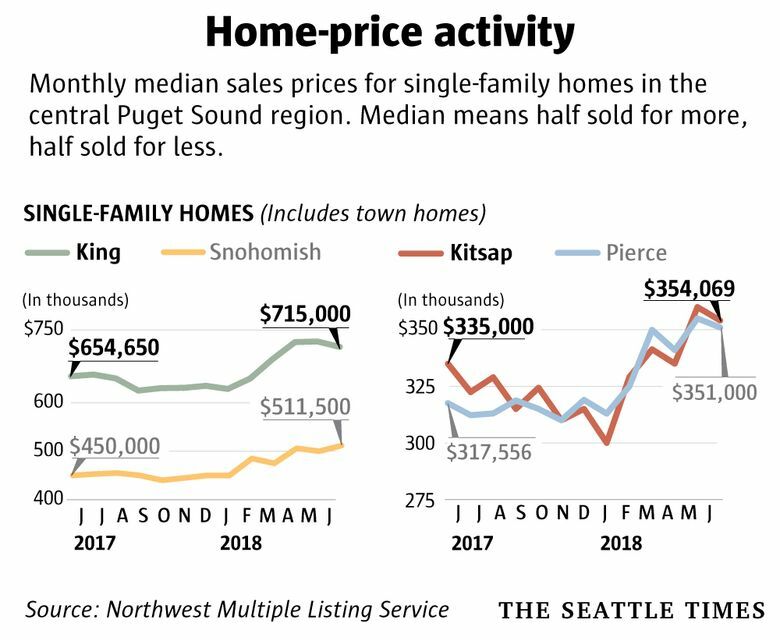 In Pierce County, home values were up 10.5 percent year-over-year to $351,000, and in Kitsap County, they grew 5.7 percent to $354,000. But both counties saw prices drop from record highs reached a month ago.